We’ve purchased many vacuum sealers over the years to preserve wild game and fish. It seems like every vacuum sealer claims to be the best, but most fall short of their promise. One thing I’ve learned, there are a lot of thumbs-down vacuum sealers out there. 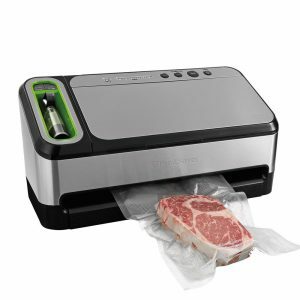 BUT, there are also some great options like the Weston Vacuum Sealer, which in our opinion is the best vacuum sealer on the market today. I’m here to help you steer clear of poorly functioning, always breaking or downright confusing vacuum sealers. 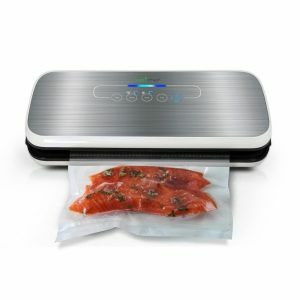 I’ve compiled a list of top-rated vacuum sealers at all price points, from commercial-grade vacuum sealers with endless bells and whistles, to more basic and affordable models. After purchasing cheap vacuum sealer after cheap vacuum sealer, I got sick of watching them all break or fail to meet basic expectations. So, I decided to invest in a meatier model. I wasn’t sure if it’d be worth it, but I sure as hell hoped so after forking over $400. Thankfully, my Weston Vacuum Sealer has proven to be a valuable investment. XL seal bar can seal bags measuring up to 15-inches wide – big enough for an entire turkey or ham! I really like how this machine has a see-thru acrylic vacuum lid that allows me to see the bag and align it just right before starting the sealing process. If you’re thinking this vacuum sealer sounds a little pricey, rest assured, you’ll know you got your pennies worth the moment you see and feel this machine in person. The hefty stainless steel design is a serious upgrade compared to vacuum sealers at lower price points. It doesn’t just look better. The Weston Vacuum Sealer can do more too, like bag an entire ham or turkey thanks to the XL seal bar that can seal bags up to 15-inches wide. That’s bigger than any other seal bar on this list. It holds up too! I’ve been using it for a while now and I don’t see myself needing to replace it for a very long time. 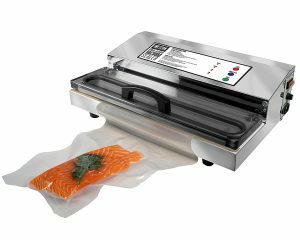 A list of the top vacuum sealers on the market today wouldn’t be complete without an appearance from FoodSaver. After all, the vacuum sealers in general are often called FoodSavers due to the brand’s popularity. The 2-in-1 refers to the automatic detection of your FoodSaver bags & automatic sealing. While this is a nice thought, we found it to be a little bit cumbersome and annoying to use. A really nice added feature is that it also has the capability to vacuum seal FoodSaver zipper bags & canisters. 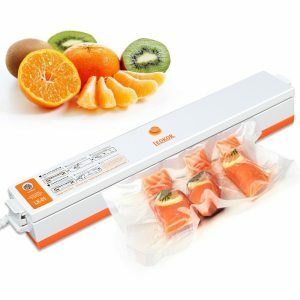 This give you a lot more versatility than you would get with any other vacuum sealer. The FoodSaver 2-in-1 4800 Series Vacuum Sealer is a great all around option at a pretty good price considering the features it comes with. The only reason it doesn’t come higher on our list is because of durability issues we’ve had with past FoodSaver models. However this particular model gave us no reason to be concerned about longevity. It appears very well made, and is clearly an Amazon Best Seller for a reason! This is a nice vacuum sealer for the price. Don’t expect wonders out of this lower end option but it’s a good place to start if you’re new to vacuum sealing or don’t do it very often. It also makes a good backup machine, say for your hideaway cabin in the woods. It does its job but it has some limitations, which should be expected based on its price point. For one, it is not for continuous use; you must wait a few minutes before reusing it to prevent overheating. Additionally, it can only be used to bag dry foods. Some vacuum sealers are bulky and cumbersome, but this one is sleek and portable. It can even attach to your refrigerator or other magnetic surface thanks to the magnet strip built into the backside of the machine. What separates a $30 vacuum sealer from a $750 vacuum sealer? This model earns its price tag because it is commercial-grade and can be used continuously without overheating thanks to its ¼ HP rotary oil pump. Small restaurants, fishermen and hunters who bag high quantities of meat and fish may want to consider making the investment in a machine of this caliber. Cheaper residential or consumer-grade sealers cannot run continuously without overheating or breaking down. Customers frequently site how much longer this sealer lasts compared to other popular models. Bonus perk: oil pump machines tend to run quieter than dry pump machines. The VacMaster is one of the heaviest on this list, weighing in at 72 pounds. 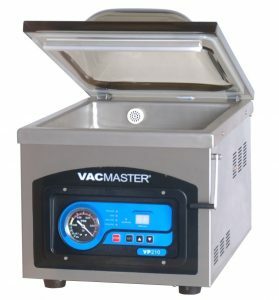 While large and advanced, the VacMaster is designed for ease of use. You can bag just about any quantity of meat or fish, as well as liquids and liquid-rich foods (soups, marinades, etc.) with this top of the line sealer. Out of 659 customer reviews, 83% give this NutriChef Vacuum Sealer a 5 out of 5 stars. So, what makes this mid-priced sealer so great? NutriChef claims to have conducted lab testing on their Vacuum Sealer to ensure the highest level of food preservation possible. This machine can bag wet or dry foods. The easy-to-use interface with LED lights and soft-touch digital buttons offer the option to select “wet” or “dry” foods. Plus, it has a fully automatic electric plug-in design. The bags that come in the Starter Kit are waterproof and reusable. The device itself is stain-resistant and easy to clean. It is available in black or stainless steel. This lightweight and portable food sealer remains so compact in part because it lacks a bag cutter and bag storage. If that sounds like a deal breaker, NutriChef offers an upgraded model with both features but it is nearly double the weight and price of this model. 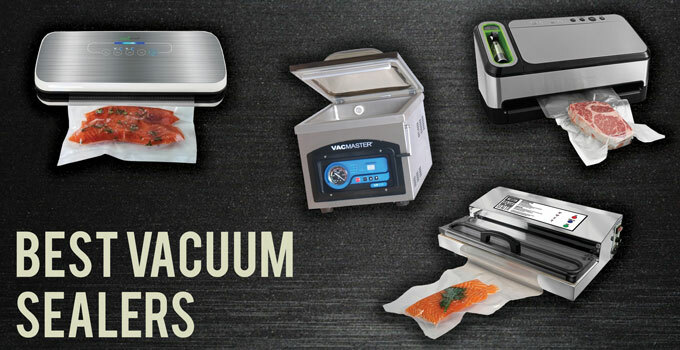 That rounds out our search for the best vacuum sealer! Be sure to also check out our articles about the best meat grinders and best food processors!